State Street Global Advisors brought its 'Fearless Girl' campaign to London. Her statue will stay in Paternoster Square, against the backdrop of St Paul's Cathedral for the next three months. The firm also announced new global diversity impact numbers on the campaign's second anniversary. Since first launching the Fearless Girl campaign in 2017 on the eve of International Women's Day, 445 companies of the 1,265 identified by State Street Global Advisors have responded to the call to action by either adding a female director or committing to do so. "We are delighted to bring this impactful campaign to London and continue to take a stand for the important issues of gender diversity at the board and senior leadership level," said Lori Heinel, deputy global CIO for State Street Global Advisors. "Studies have shown that companies with greater gender diversity at the senior leadership levels generate better returns than their peers. That drives our conviction to continue our engagement and voting efforts as we look to make further progress on this important topic," added Heinel. 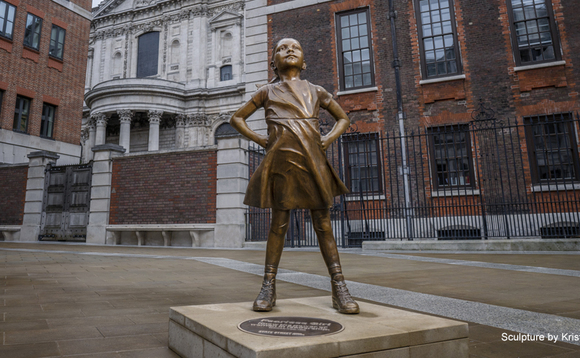 "We are delighted to welcome Fearless Girl to the City. This builds upon the City of London Corporation's continuing efforts to increase the recognition of women in the City's public realm," said Catherine McGuinness, chair of the policy and resources committee at the City of London Corporation. "I hope that Fearless Girl will serve as a reminder of the progress we have made and the progress we still need to make." David Schwimmer, CEO of London Stock Exchange Group commented: "The London Stock Exchange Group fully supports her mission of raising awareness of the importance of diversity on boards and within senior corporate leadership." State Street Global Advisors also announced new impact numbers demonstrating continued progress for the firm's gender diversity asset stewardship programs in the US, UK, Australia, Japan, Canada and Continental Europe. Concluding its second year, 423 companies identified by State Street Global Advisors have now responded to the firm's call by adding a female director to their previously all male boards and another 22 have committed to do so. Starting in 2020 in the US, UK and Australian markets, and in 2021 in Japan, Canada and Continental Europe, the company will vote against the entire slate of board members on the nominating committee if a company does not have at least one woman on its board, and has not engaged in successful dialogue on State Street Global Advisors' board gender diversity program for three consecutive years. As a result of State Street Global Advisors' Fearless Girl campaign, companies and shareholders worldwide have been inspired to focus on the issue of gender diversity. Highlighting just two examples since the firm last reported impact numbers, it has seen the number of companies adding a female director increase by 57% in the UK and 48 percent in the US.